Posted October 13, 2015 . Filed under News. Both Arjan Gosal and Paul Evans (PhD students) presented their research at the IUFROLE 2015 conference this year August. See below for the abstracts. The Millennium Ecosystem Assessment highlighted the importance of quantifying ecosystem services as being pivotal to the allocation of environmental resources. Whilst biophysical and economic values are often used in management and conservation planning decision making, community ecosystem values are rarely quantified or defined clearly. Recreation, aesthetics and cultural ecosystem services are primary in this study. Various techniques, including participatory GIS, spatial mapping, and existing data sets are explored in relation to the New Forest. Situated on the South Coast of England, it is a prime example of a historic natural landscape, from being a medieval hunting ground to a commoning system that survives to the current day. England’s most recently designated national park has over 34,000 residents and many more visitors each year. With a clear need to understand the dynamics of how people value the various habitats and areas of this national park, this study aims to inform future management decisions made by the managing authority through a robust and adaptable methodology. Results from stakeholder engagement, including spatial mapping of services and a multi-spatial criteria analysis of various ecosystem services for differing management strategies are presented. Ecosystem services (ES) are the products of functioning ecosystems and so provide a convenient metric by which to test ecosystem functionality. Forests provide the greatest multi-functionality of any habitat, making them particularly important for ES provisions. However, environmental change and anthropogenic stressors are decreasing the condition of forests globally, inevitably reducing their functionality. Ecological thresholds and abrupt regime shifts are critical to identifying the resilience of ecosystems. While evidence exists for thresholds in aquatic ecosystems, prospects of them in terrestrial ecosystems are still largely theoretical, but would have major implications upon forest functions at the landscape and regional scales. To test whether thresholds exist in ES provisions and ecosystem functions as forests become increasingly degraded (termed forest collapse), various ES were measured over a gradient of collapse in the New Forest, UK – woodland that is currently undergoing major decline. Using replicated plots of different stages of forest collapse, relationships between various ES and collapse were measured. Preliminary results suggest that thresholds can be identified in some ES provisions, indicating that ES decrease more rapidly past a certain point. Posted August 11, 2015 . Filed under News. 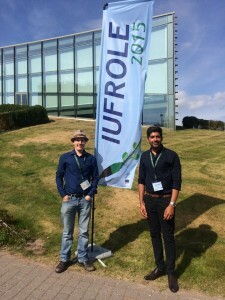 Work from our project was recently presented by Phil Martin at the biggest conservation conference of the year, the International Congress on Conservation Biology in Monpellier, France. To have a look at the poster see here. Posted August 10, 2015 . Filed under News. Last month our team (particularly Phil Martin ) helped to organise a workshop bringing together researchers interested in resilience from across the Biodiversity and Ecosystem Service Sustainability (BESS) programme run by NERC. “Is it real? Is it an obscure object of desire?” our group’s leader Adrian asked during the workshop . Given that nearly 20 years ago there were 163 different definitions of ecosystem resilience, it is perhaps no wonder that we we having a few problems. Part of this problem is that resilience is a boundary object – a term that is interpreted differently by different communities. During our meeting it became clear, for example, that ecological researchers and policy-makers did not necessarily mean the same thing when they were talking about resilience. Recovery – The return of a variable to the reference state after a disturbance. Resistance – A variable staying essentially unchanged despite disturbances. Persistence – Persistence of the system over time. Using these three different properties allows researchers to look at different aspects of resilience and compare across systems. Making such comparisons is actually very difficult due to constrains on time and funding, as well as logistical problems. For example, to compare resistance of different communities you would ideally apply different intensities of disturbance in different locations. This may be possible in some relatively ‘fast’ systems such as grasslands but it is unlikely that you would get permission to do this to a woodland where you might have to cut trees down. In order to resolve this, mechanistic models can be exceptionally useful for investigating different scenarios of change. Combining this with empirical data collection in the same system can help us gain a more detailed understanding of resilience. This is something we are aiming to do in our current project as part of my post-doc work. By 2020, ecosystem resilience and the contribution of biodiversity to carbon stocks has been enhanced, through conservation and restoration, including restoration of at least 15 per cent of degraded ecosystems, thereby contributing to climate change mitigation and adaptation and to combating desertification. A biodiverse natural environment with healthy functioning ecosystems that support social, economic and ecological resilience and the capacity to adapt to change. It is also included in US and Australian policy. So in the case of policy-makers it becomes clear that resilience is seen as a target. While for researchers resilience can mean something very specific policy-makers probably consider it to be closest to the previous definition of persistence. At our workshop there were plenty of anecdotes about policy-makers saying things like “resilience is the new sustainability” and telling civil servants to “stick some resilience in your report, it’s the new thing.” There were also reports that some policy-makers wanted the production of maps of resilience. I think this is potentially dangerous. Given that the ratio of empirical work to conceptual stuff/reviews and perspectives pieces is about 1:1000 we simply don’t have enough evidence to produce these maps at the moment. If push came to shove then we could probably come up with a best guess based on ecological theory, but even then there would be all sorts of caveats. I think it’s clear we will never reach a point where there is one definition of resilience that fits everyone’s need. However, when we talk about resilience we need to be clearer about what we mean by it. So next time you use it in a paper, for the love of god, define it. *Edit #1 – I just came across this nice post by Jeremy Fox on defining stability concepts in ecology, which, if might be a useful companion piece to what I said here. *Edit #2 – Ambroise Baker who helped organise the workshop with me has a short summary of the meeting over on the Lake BESS blog, you can see that here. Posted November 26, 2014 . Filed under News. Posted March 31, 2014 . Filed under News. We are seeking to appoint a Forest Ecology Research Technician in support of the NERC BESS-funded “Dynamics and thresholds of ecosystem services in wooded landscapes” project. Posted March 17, 2014 . Filed under News. We are seeking to appoint a post-doc research assistant in support of the NERC BESS-funded “Dynamics and thresholds of ecosystem services in wooded landscapes” project. Posted February 12, 2014 . Filed under News. Do you live or work in and around the New Forest and have 15-20 minutes to spare? Please help one of our PhD student (Arjan Gosal) to fill his survey at www.newforestsurvey.co.uk and you could win one of two £20 Amazon vouchers! The aim of this survey is to garner the valued opinions of the community which reside and work in and around the New Forest National Park. The survey data will be used to determine which services and habitats are most important to different groups of people. This information will then be incorporated along with the online mapping exercise data into geographic models to show ecosystem service values within the New Forest National Park. Posted February 3, 2014 . Filed under News. Prof. Adrian Newton and his research team are presenting a poster at the New Forest Wildlife Forum – Saturday 8 February 2014.